Just when I think I may be hard pressed for a recipe theme, I see that there are two pretty tasty food holidays on the horizon; Jan. 20 is National Cheese Lover’s Day and Jan. 27 is National Chocolate Cake Day! Since I couldn’t begin to pick between the two, I’m honoring both days with the recipes below. “Cheese contains a host of nutrients like calcium, protein, phosphorus, zinc, vitamin A and vitamin B12. Calcium is one of the nutrients most likely to be lacking in the American diet. According to government statistics, nine out of 10 women and six out of 10 men fall short of calcium recommendations. The high-quality protein in cheese provides the body with essential building blocks for strong muscles. “If you are lactose intolerant, many cheeses, particularly aged cheeses such as Cheddar and Swiss, contain little or no lactose and are often well tolerated. Calories still matter, so grating smaller portions of hard cheese over dishes or using small amounts of aromatic or sharp cheese over dishes will help cut calories without sacrificing flavor. Also consider reduced-fat cheeses. • Take chilled cheeses out of the refrigerator an hour or two before servings. • Leave cheeses like mozzarella and feta in their original packaging, replacing the water every two days. • Don’t store cheese near strong smelling foods — it may absorb the scent. • Store other cheeses by wrapping them in waxed paper and placing it in a loose food bag to maintain humidity. Blue cheeses in particular should be tightly wrapped. • Store cheese in the warmest part of the refrigerator, like the vegetable drawer. As for storing chocolate cake, I don’t think I’ve ever had to store one because it is always gone with the first serving! This week, you truly can have your cake and eat it, too — along with a delicious cheese-filled dish! Janelle Thomas can be reached at janellethomas@charter.net. Preheat oven to 350 degrees. In a medium bowl, combine flour, sugar, 2 tablespoons cocoa, baking powder, salt, milk, oil and vanilla. Batter will be very thick. You might need to stir with a metal spoon. Spread batter into a greased 9-inch pie plate or square pan (Note: Make sure pan has tall sides, otherwise the cake might run over a bit.) Combine brown sugar and 1/4 cup cocoa. Spread over batter. Top with hot water. Bake for about 30 to 35 minutes until top is dry and puffed. (Note: Put a cookie sheet underneath pan in the oven, just in case a little spills over.) Serve warm with ice cream. Recipe courtesy of thereciperebel.com. Preheat oven to 350 degrees. Spray a 10-inch bundt pan with nonstick cooking spray and sprinkle the inside with flour. Combine brewed coffee and cocoa powder in a small saucepan and bring to a boil, whisking frequently. Remove from the heat and let cool back down to room temperature, about 30 minutes. When the coffee mixture is nearly cool, combine sugar, salt, baking soda, eggs and egg yolk in the bowl of a standing mixer fitted with the whisk attachment. Mix on low until evenly combined, 1 minute. Add buttermilk, oil and vanilla extract and mix on low for 1 minute. Add flour and mix on medium for 2 minutes. Add cooled coffee mixture and mix on medium for 3 minutes. (Note: The batter will be very runny and should pour easily.) Pour into bundt pan and bake until a knife inserted in the middle comes out clean, 60 minutes. Let the cake cool completely before flipping it out onto a cake stand. At this point you can keep the cake at room temperature or refrigerate it (covered with plastic wrap) for one day. 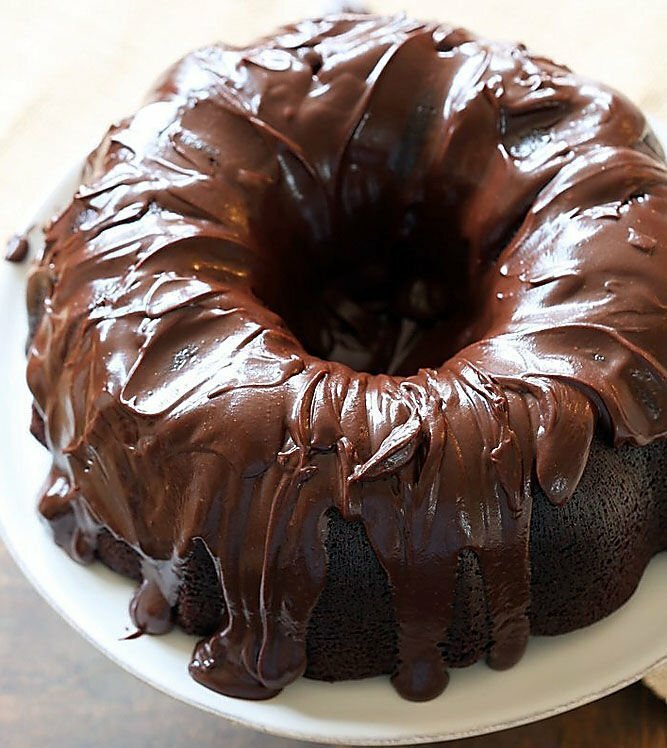 To make the glaze, put chopped chocolate in a heatproof bowl over a pot of barely simmering water (make sure the bottom of the bowl is not touching the water directly; or use a double boiler). Heat, stirring frequently, until fully melted. In another bowl, melt the butter in a microwave in 15-second increments, stirring between each. Whisk melted butter into melted chocolate until fully incorporated. Sift in half the powdered sugar. Add the sour cream and whisk to combine. Sift in the remaining powdered sugar and whisk until smooth. Batter will be stiff. When fully mixed, the glaze should be thick and shiny. Add coffee and whisk again to create a glossy glaze. (You may need to add a splash of hot water to get the glaze smooth and creamy. Pour the glaze over the surface of the cake, letting it drip down the sides and middle. Let the glaze set for at least 1 hour before serving. Note: If you don’t have buttermilk, just use plain yogurt watered down with a splash of water or milk with some vinegar (1 tablespoon of white vinegar with milk added to make 1 cup. Let sit for two minutes. Pour out any extra to get the correct measurement needed. Recipe and photo courtesy of inquiringchef.com. Preheat oven to 350 degrees. Lightly grease an 8-inch round cake pan with nonstick cooking oil spray. Combine flour, sugar, cocoa powder, baking powder and salt in a large bowl. Whisk thoroughly to combine well. Add oil, egg, vanilla and milk to the flour mixture and beat well to combine. Pour in the boiling water (with the coffee), and mix until glossy. Pour the cake batter into the prepared pan. Bake for about 40 to 45 minutes, until a toothpick inserted in the center of the chocolate cake comes out semi-clean with small amount of cake (not runny batter) on it due to the fudgy texture. Remove from oven and allow to cool for 20 minutes. Transfer cake from the pan to a wire rack and cool completely before frosting. For the chocolate ganache, pour the cream into a small saucepan and heat over low heat for a few minutes. Watch that it doesn't boil or simmer. Once the cream is hot, remove from heat. Add in the chocolate chips; cover saucepan with a lid and let sit for 5 minutes to soften and melt the chocolate. Uncover, and stir slowly first, with a spatula or wooden spoon, gradually mixing faster until ganache is smooth, creamy and glossy. Refrigerate for one hour or hour and a half until thick enough to spread (similar consistency to Nutella). Spread evenly over the cake. Note: For a fluffier cake, use 2 teaspoons baking powder. For a fudgier cake, use 1¼ teaspoons baking powder. Recipe and photo courtesy of cafedelites.com. Heat oven to 450 degrees. Place pizza crust on a baking sheet; brush with olive oil. Spread tomatillo salsa over crust to 1/2 inch of edges. Top with Cheddar-Jack cheese, chicken, corn and green chiles. Sprinkle with Pepper Jack cheese. Bake for 10 to 12 minutes or until cheeses are melted. Layer with avocado and green onion. Top with red peppers, bacon and cilantro if desired. Recipe and photo courtesy of wisconsincheese.com. Cook fettuccine according to package directions until al dente. Meanwhile, melt butter in a large skillet over medium-low heat. Add garlic; cook and stir for 1 minute. Gradually whisk in cream and pepper. Bring to a gentle boil over medium heat, whisking constantly. Cook and whisk for 2 minutes. Reduce heat to low; gradually stir in Parmesan and Pepper Jack until melted. Add chicken; heat through, stirring constantly. Remove from the heat. Drain fettuccine; place in a serving bowl. Add chicken Alfredo mixture; toss to coat. Note: Use Kindred Creamery Ghost Pepper Colby Jack cheese for an extra spicy taste of ghost peppers. Recipe courtesy of wisconsincheese.com. In a large saucepan (6-quarts or so), add the chicken broth, onion, salt and pepper. Bring the mixture to a simmer and add the broccoli. (It won't be completely covered with liquid.) Cover the pot and cook for 8 to 9 minutes until the broccoli and onions are tender. In a blender, combine the milk and flour and process until smooth. Slowly add the milk mixture to the soup, stirring quickly. Bring the mixture to a gentle simmer, stirring constantly, and cook until thickened, 3 to 4 minutes. Turn the heat to low and stir in the cheese, one handful at a time, letting each addition melt before adding more. Season to taste with additional salt and pepper, if needed. Serve immediately. (The soup will thicken as it cools.) Makes 6 to 8 servings. Recipe and photo courtesy of melskitchencafe.com. Preheat oven to 350 degrees. Prepare pasta according to package directions. Drain and pour back in your pot. 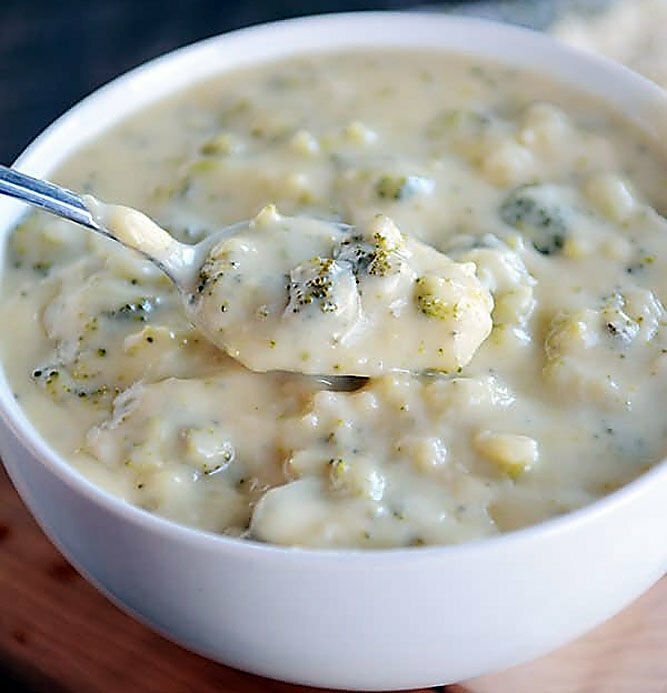 In a large bowl, combine Alfredo sauce and sour cream. Add ziti and toss until coated. Spoon half of the pasta into a greased 9-by-13-inch dish. In a separate bowl, stir together ricotta cheese, eggs, Parmesan and most of the parsley. Spread evenly over pasta in the baking dish. Evenly spoon remaining pasta on top. Sprinkle with mozzarella cheese and a little fresh Parsley. Bake for 25 to 30 minutes. Recipe and photo courtesy of lilluna.com. Heat oven to 350 degrees. Grease or spray 13-by-9-inch pan. In large bowl, place cooked and drained penne pasta, Alfredo pasta sauce and 1/2 cup ranch dressing. Stir to combine. Pour mixture in pan; spread evenly. Sprinkled 6 slices chopped, cooked bacon evenly over top, then sprinkle with 2 cups shredded mozzarella cheese. Bake 15 to 20 minutes or until hot and bubbly. Let stand 5 minutes before serving. Sprinkle with chopped parsley. Recipe courtesy of flavorite.net. Divide mixture into 10 pieces. Insert a cube of cheese in each, rounding and sealing the meat to enclose the cheese. Heat cooking oil in large oven-safe skillet and brown meatballs, in batches, if necessary, 8 to 10 minutes. Remove skillet from heat. Place meatballs in oven to fully cook, 8 to 10 minutes more. Serve with warm sauce and spaghetti. Sprinkle with shredded cheese, if desired. Recipe courtesy of wisconsincheese.com. Prepare macaroni according to instructions on box. Drain and return to pot. Add 3 cups of cheese, milk, eggs, butter and cream cheese. Add salt and pepper to taste. Pour into a greased 9-by-13-inch casserole dish. Top with the remaining 1 cup of cheese. Bake at 400 degrees for 30 minutes. Makes 8 servings. Recipe courtesy of thebudgetdiet.com.